I'm taking you on a tour of how I source breed-specific, sustainable wools. 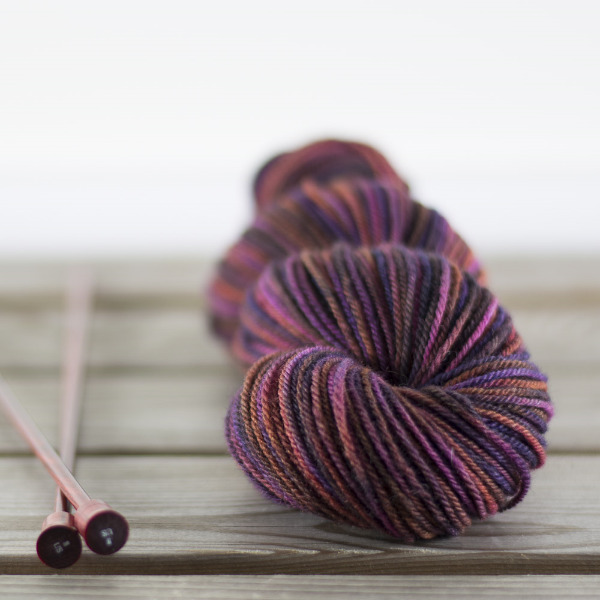 Last week, I shared how I discover new-to-you fibers. This week, I'll tell you how I find the sources of the wools I use: happy, healthy flocks of sheep. Once I find a nearby shepherd with a breed I'm looking for (usually via the the Canadian Wool Growers' Cooperative Board listings), I arrange to pay a visit to the flock. I want to get a sense of how the sheep are treated and find out what characteristics the shepherd is breeding for. I also do my best to check out the quality of the fleeces, but this can be is tough when they're still on squirming sheep suspicious of a never-before-seen human. A Jacob lamb from Cindy Ghent's flock in Ontario. If the sheep are well-cared for and the fleece looks promising, I go back after the flock has been shorn to select fleeces. Then, when I get home, I choose a fleece, wash part of it, and prepare it for spinning in several ways: handcarding, drumcarding, and combing. Then I spin a number of different sample yarns using different techniques. This gives me a sense of how the yarn might best be spun by machine. Gulf Coast Locks from a sheep named George. Next I consider the gaps in Sheepspot's product line to make the final determination about how to have the wool spun. My dream is to eventually offer a worsted-spun and woolen-spun yarn in each weight from laceweight to aran, each in a different breed. Then comes the hardest part of the process: finding the right mill to spin it. This has been the steepest learning curve for me. Mills are constrained by the strengths and weaknesses of their equipment, and can't always spin the wool in the way that I've envisioned. Often I'll send wool samples to several mills to determine the best fit. When I've gathered all the information I can, I ship the fleeces to the mill and wait (and wait, and wait) and hope. Clun Forest Sport in Dusk in the Desert. It's a long process with plenty of bumps and pauses, and I don't know the outcome until I get the yarn and open the box. Sometimes, as in the case of last fall's Clun Forest Sport, I love the result. Other times not so much, and I have to make the difficult decision not to ship a yarn that's not up to Sheepspot standards (it's happened). But when it works, it is so satisfying to open a box of brand-new, undyed yarn made from the wool of a breed I love. And it's even more satisfying to be able offer you breed-specific skeins from sustainable flocks that you can't find anywhere else. What does "hand-dyed" mean, anyway?